A week or so ago I posted a sketch of a fancy door in Quebec City. A comment from a long-time friend, Pat Roberson, asking for more door sketches has resulted in this one. A week ago I saw this door but I was on my way to St. Vallier to sketch with friends and so couldn’t sketch it. 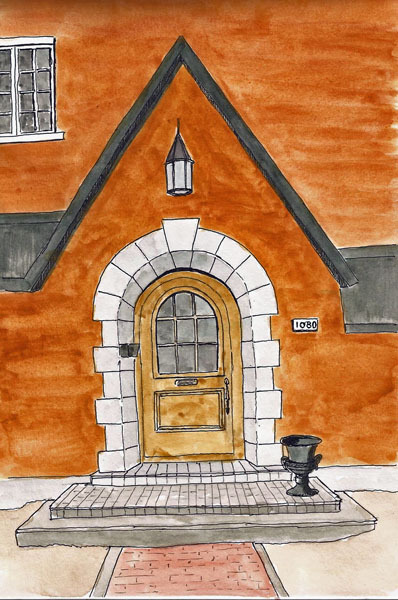 It’s not one of the old, classic Quebec City doors, but Pat is such a fan of Halloween, and apparently doors, that I just had to go back and sketch this aperture into the bright orange house with black trim. Hope you like it, Pat.